I just got back from a vacation in northern Thailand. It is a beautiful country, fantastic weather, and friendly people. 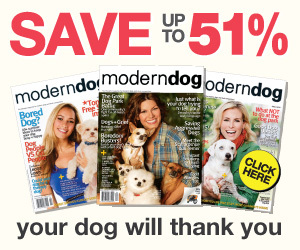 While there I couldn’t help but do a little dog research. Dogs in Thailand have a unique lifestyle. I spoke with every guide I had about the dogs to try and get a complete view. The dogs are what my guides called “local dogs” and then there are pets- the dogs that live in people’s houses. The local dogs are basically strays, but more like village dogs, groups of dogs that live together in a given area and kind of “belong” to a certain family or area. 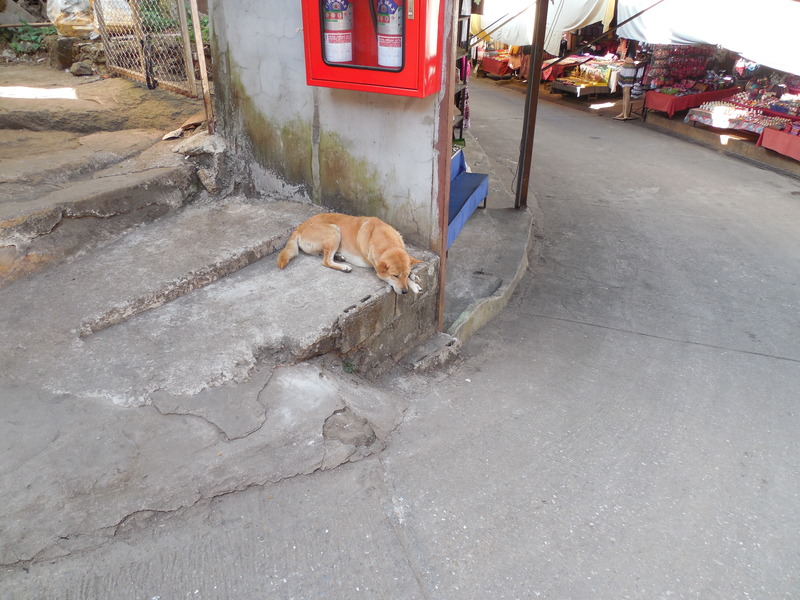 The local dogs I saw were calm, non-aggressive, even friendly. I knew enough not to pet them (although I wanted to). 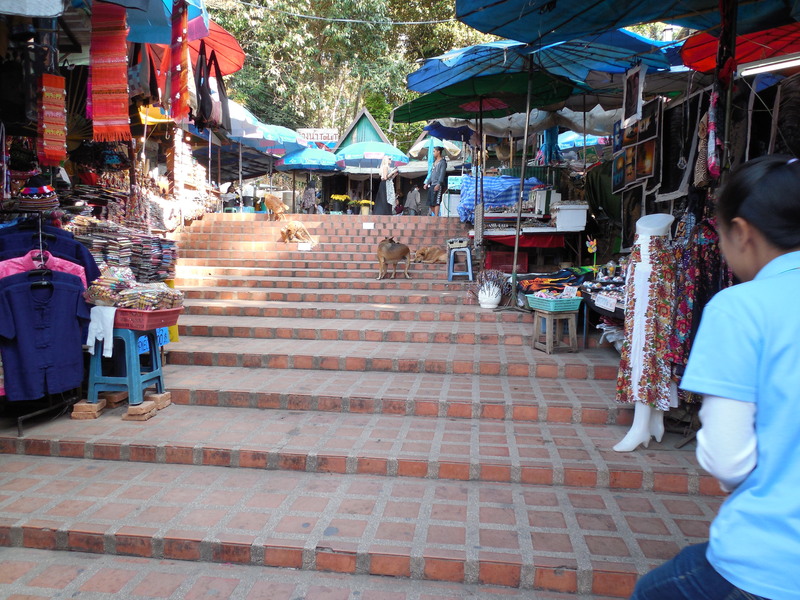 It amazed me that the local dogs had this sense of camaraderie and did not fight with one another or other dogs, did not approach humans- even for food, and the Thais did not approach them. Life just carried on around them as if they existed as part of the landscape. 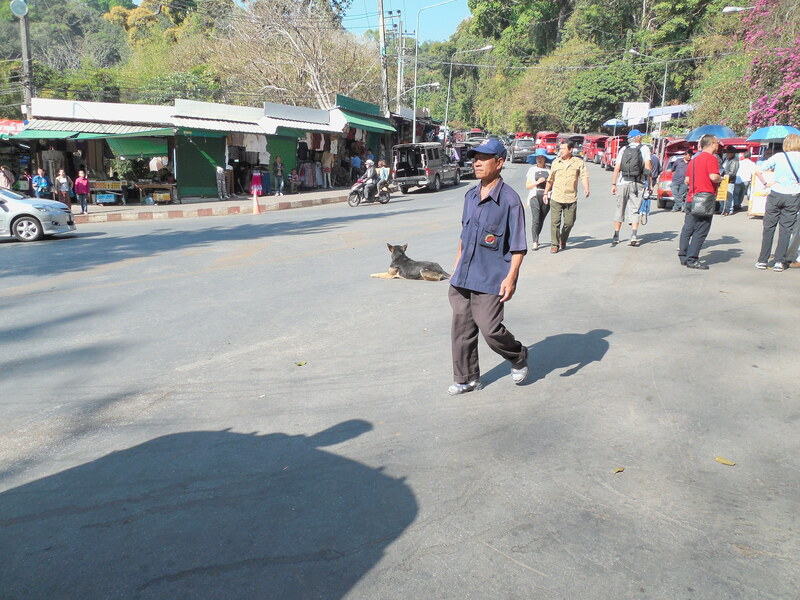 The dogs frequently stay at the side of the road. More than once the car I was in had to slow down or stop and go around the dog that was sitting in the road sunning himself or scratching himself! The Thais don’t care- they are used to it. My drivers didn’t swear or honk at the dogs, they just drove around them. While in a remote hilltop village visiting a tribe of locals called the Hmong, I spotted a village dog and took a picture. 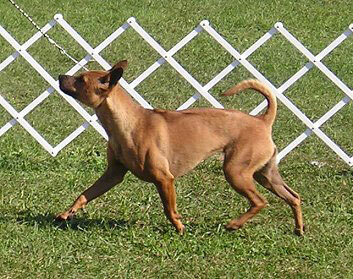 Then I looked closer and thought wait a minute- that’s a Thai Ridgeback! I wanted to pet this dog and get closer and inspect it but that was not wise. I know that Ridgebacks (like the Rhodesian Ridgeback) can be strongwilled and territorial particularly if not socialized/trained, and considering that this was clearly a local dog I didn’t want to get too close. It was also clear that this was not a purebred- the coat was too furry, too long. But when he was standing, his ears were perked up, his tail curved over his back and he had that very distinctive stripe down his back. It was cool, these dogs are not in Michigan! 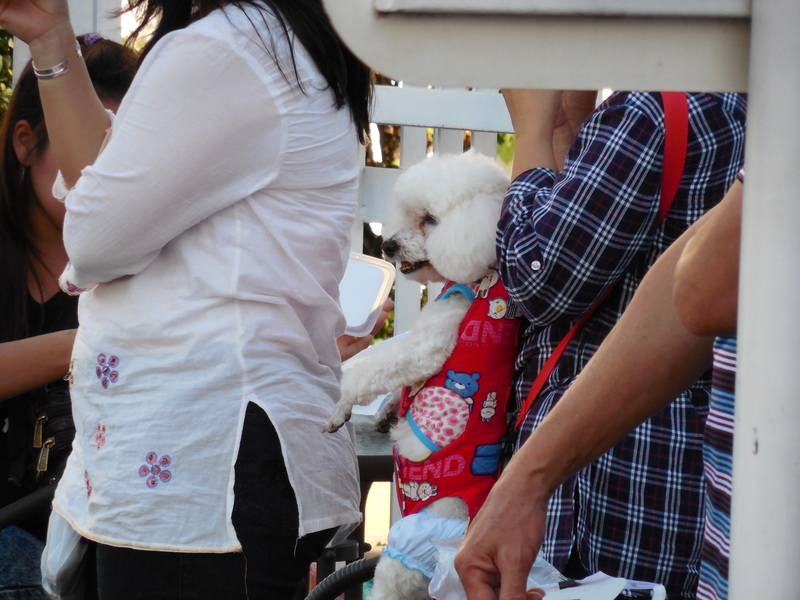 For a contrast, I saw this dog at the flower parade. He clearly is wearing an outfit and seemed to be comfortable in his carrier. Every so often I would see his owner dip her fingers in a cup of water and let him lick her fingers for a drink. Weird. Well, to me. The pet dogs I saw were all small dogs. When I asked my guides about the pet dogs she said the pet dogs were small- most people had Shih Tzus. In fact, she had a Shih Tzu. Most of the local dogs were big dogs. Most Thais don’t have the room for a big dog, and they find a small dog cuter. They can carry around a small dog but not a big dog. It is a stereotype in full effect in Thailand. I saw many signs asking for donations to help provide food and vaccinations for the “temple dogs”- the local dogs that live at the various temples. I only saw one sign for a veterinarian. Some things were quite charming about the dogs. The people live with them and there appears to be no problems with fighting or mauling like we have here in Detroit (although I’m sure that occurs occasionally). 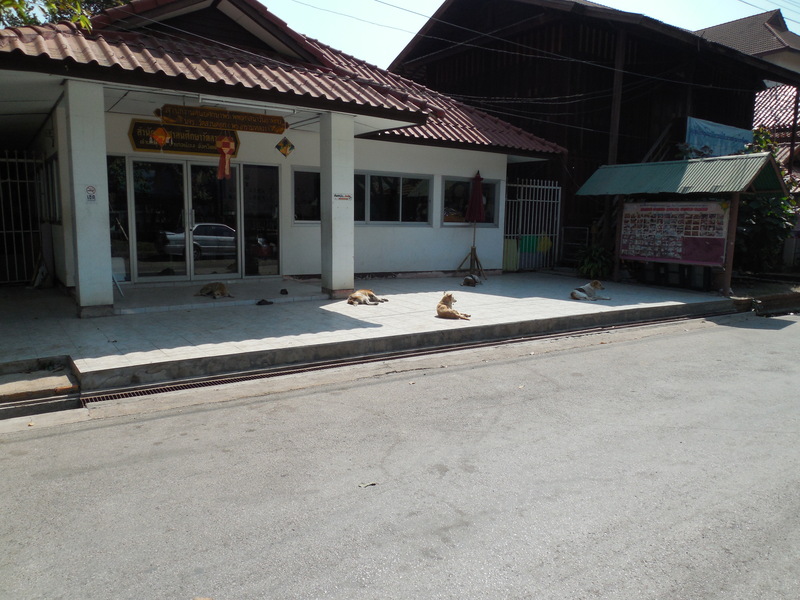 On the other hand there is an extraordinary amount of stray dogs in Thailand and that itself is depressing. A spay/neuter program could be more helpful than a food/vaccination program, although every little bit helps to a better quality of life. Overall it was an eyeopening experience and made me miss Reggie that much more. He doesn’t how good he has it!